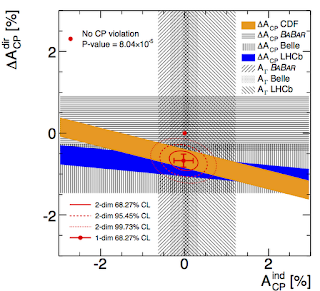 The most interesting non-Higgs results coming from the LHC in 2011 was the observation CP violation in neutral D-meson decays delivered by the LHCb collaboration. 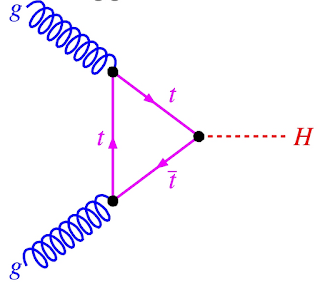 Recall that LHCb studied the decays of the D and anti-D mesons into a pair of charged pions and a pair of charged kaons. For each D → π+π- and D → K+K- one can measure the decay rate, and subtract the analogous decay rate of anti-D (and normalize by the sum), thus obtaining the asymmetries A(π+π-) and A(K+K-). If either of the asymmetries is non-zero, that means the particular partial decay width is different for the particle and the anti-particle, which is a signal of CP violation. 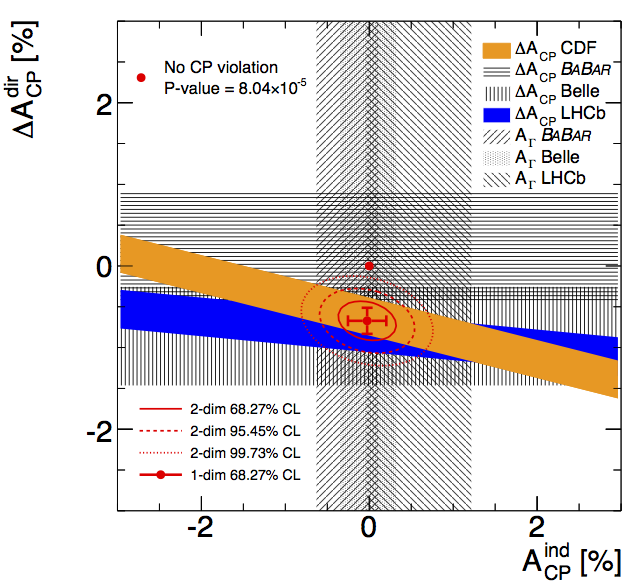 Since the total number of D and anti-D produced in LHC collisions is different and hard to estimate, LHCb quoted only the difference of the asymmetries ΔA = A(K+K-) - A(π+π-) where that uncertainty cancels out. 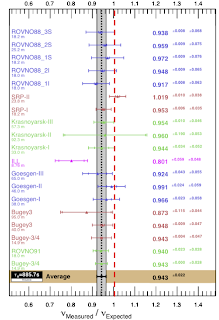 They found ΔA = (-0.82 ± 0.24)%, significantly away from zero, which constituted the first evidence for CP violation in the charm sector at the level of 1%. 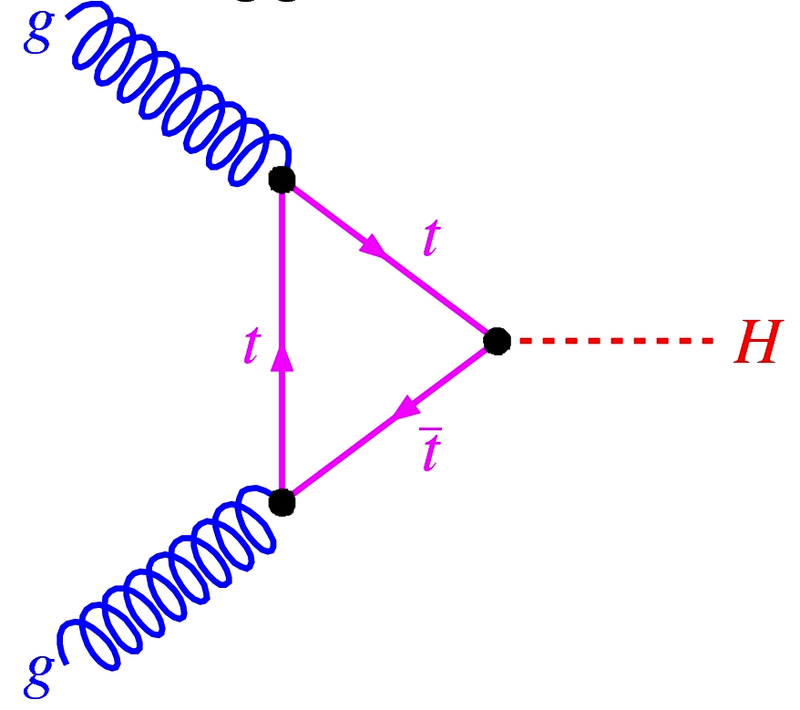 What distinguishes this result from 1000 other flavor physics observables presented by the LHC, Tevatron, and B factories is that, until last year, theorists expected Standard Model processes to provide much smaller contributions to the CP asymmetry in D meson decays, estimates lying in the ballpark of 0.01-0.1%. See also the CDF talk in La Thuile. Many a time I have stressed on this blog that neutrinos are boring, though I should specify that they are boring from the point of view of a theoretical physicist. For experimentalists, on the other hand, neutrinos are first of all annoying. Indeed, taking part in a neutrino experiment seems the shortest path to trouble, because of weird anomalies affecting every other experiment. Although the most notorious anomaly - the phantom of OPERA - appears to be dead and buried, there remain several spooky effects observed by other experiments. Here is a list of the most interesting neutrino anomalies that to date have not been explained away. LSND anomaly. The mother of all neutrino anomalies. The LSND experiment in Los Alamos was shooting a beam of 20-200 MeV muon antineutrinos and looking for an appearance of electron antineutrinos in a detector 30m away. They saw a clear excess of electron antineutrinos which at the time was being interpreted as the first evidence of neutrino oscillations. 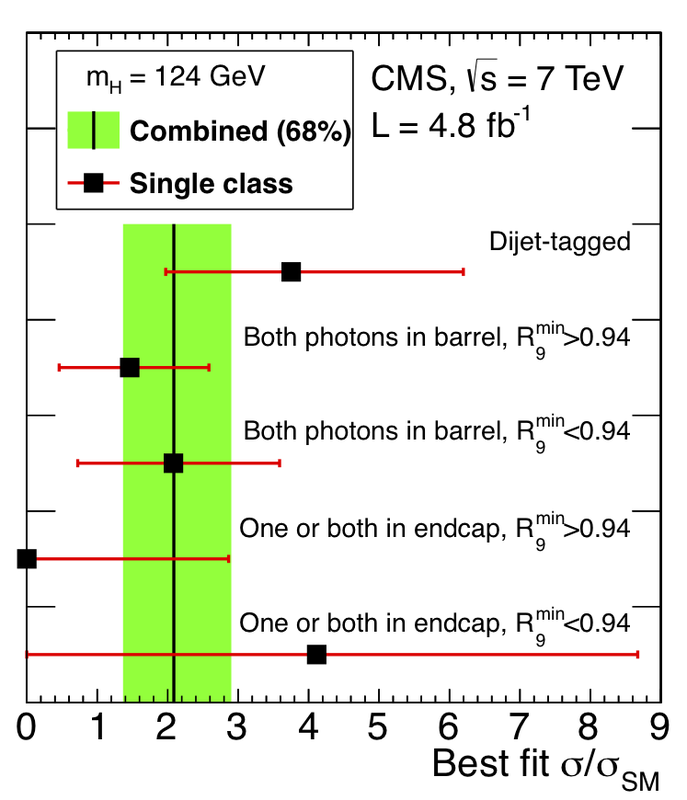 However, the LSND result would correspond to a neutrino mass difference of nearly 1eV, whereas subsequent experiments (Super-K, KamLAND, SNO) demonstrated that, although the 3 Standard Model neutrinos can indeed oscillate one into another, the mass differences are much smaller than suggested by the LSND. The LSND result thus cannot be explained with 3 active neutrinos, although it may fit in a larger framework with one or more sterile neutrinos. MiniBoone anomaly. 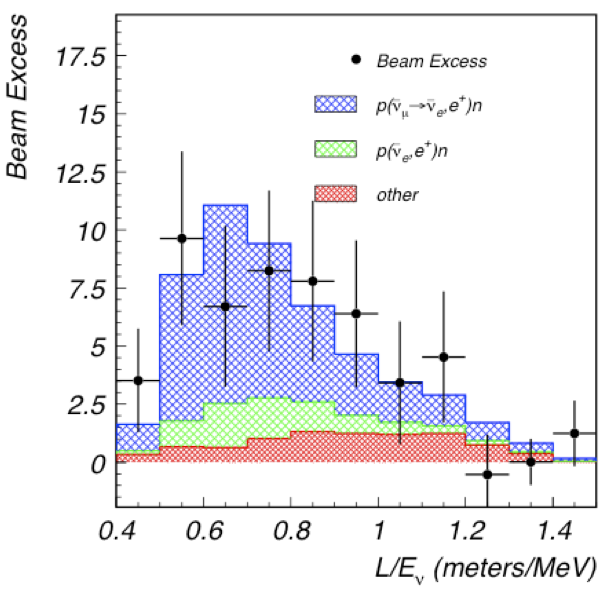 Conceived as the ultimate test of the LSND anomaly, with a larger baseline (540m), larger neutrino energies (0.5-3 GeV), but a similar L/E. 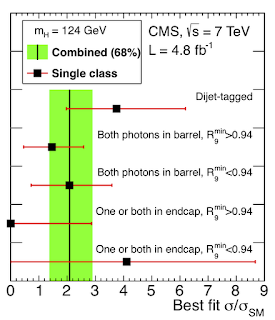 The Miniboone experiment in Fermilab was also looking for an appearance of electron neutrinos in a beam of muon ones, moreover it had a button to choose between neutrino and antineutrino beams. One clear result was a refutal of the simple 2-neutrino oscillation interpretation of the LSND signal, as nothing was seen in the signal region in the neutrino mode. However, the experiment saw a weird excess of electron-neutrino-like events at low energies, in the neutrino mode below, and in antineutrino mode just above their analysis threshold. Again, there may be a more complicated framework with several sterile neutrinos where these results can be accommodated. In preparation is the MicroBoone experiment which will be the ultimate test of the MiniBoone anomaly. Gallium anomaly. The least known of the neutrino anomalies. 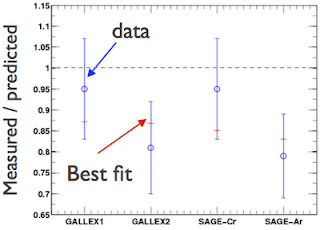 The GALLEX and SAGE collaborations were gallium-target radiochemical experiments focused on studying solar neutrinos. For calibration purposes, they measured the flux of electron neutrinos produced by artificial radioactive sources placed inside the detectors. They found the observed-to-expected flux ratio to be 0.86 ± 0.06, as if some of the neutrinos were vanishing by oscillating into sterile ones. Reactor anomaly. 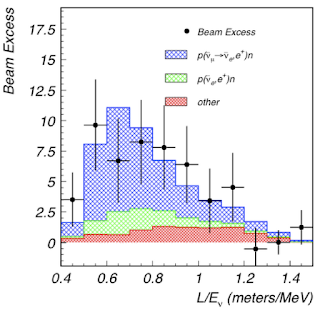 An oven-fresh neutrino anomaly based on ancient experimental results. Over the years several detectors located near nuclear power stations all over the world measured the flux of electron antineutrinos emitted from the reactors. At the time none of them noticed anything unusual, on average the flux was maybe 1 sigma below the expected one. However, a recent progress in modeling nuclear reactions led to a reevaluation of the neutrino energy spectrum and emitted power, which increased the expected flux. Therefore, the short-baseline reactor neutrino experiments now face a deficit of the neutrino flux: the observed to expected rate is 0.943 ± 0.023, roughly a 2.5 sigma discrepancy. Again, are electron neutrinos rapidly oscillating into sterile ones, thus vanishing from our sight? The reactor anomaly will be soon tested by an experiment with the ominous name Nucifer, located 7m from the reactor in Saclay. As you can tell, the neutrino anomalies described above are not as spectacular as breaking the speed of light, but for exactly this reason there is a better chance that at least one of them is trying to tell us something about the real world… Are they signals of unexpected new physics, or just a manifestation of difficult to control systematic effects inherent in neutrino physics? The latter is of course far more likely, but nevertheless it will be interesting to follow the updates. I borrowed heavily from a seminar of Guillaume Mention, slides here. 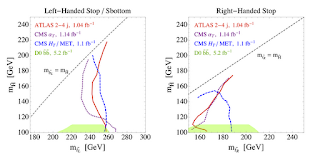 Since summer 2011 we know that in a generic case when all colored superpartners including stops have comparable masses and decay to the lightest supersymmetric particle (LSP) producing a considerable amount of missing energy then stops have to be heavier than about 1 TeV. Since last Tuesday we know if the only squarks below TeV are those of the 3rd generation then gluinos have to be heavier than about 600-900 GeV, depending on the details of the supersymmetric spectrum. An example of the recent ATLAS bounds is shown on the right. 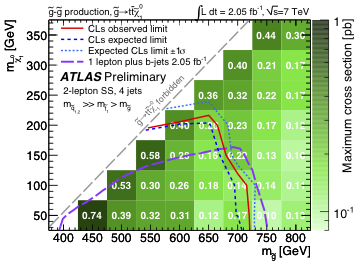 The assumption here is that the gluino decays via an intermediate virtual stop into 2 top quarks + LSP. In that case, combination of searches in the 2 same-sign lepton channels, and the 1 lepton + 1 b jet channel excludes gluino masses all the way up to 700 GeV, a bit more if the LSP is nearly massless. 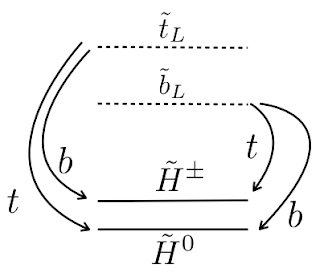 Even stronger bounds are reported assuming gluinos decaying via a virtual sbottom squark into 2 bottom quarks + LSP. In that case gluino masses up to 900 GeV are excluded, see below. However there still exists one important loophole. 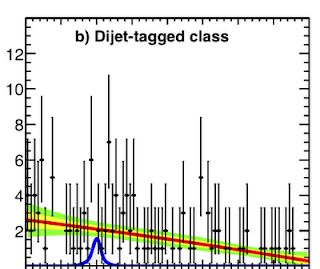 One can imagine that gluinos are very heavy, and only the 3rd generation squarks have masses below 1 TeV. In that case, the 3rd generation squarks have to be produced directly in gluon-gluon collision without a help from intermediate gluinos, in which case the production cross section is suppressed. Strangely enough, limits on direct stop production are currently almost non-existing. As explained in my previous post, there exist some theorist-level limits derived by reinterpreting other LHC searches which claim that stops need to be heavier than 200-300 GeV, depending on how they decay. Thus, for all we know, the stop might have a similar mass to the top quark without having been noticed at the Tevatron or LHC! Plugging this loophole is now the most important issue in SUSY phenomenology. For the direct production of sbottoms, who should come in package with stops due to the SU(2) symmetry of weak interactions, the current experimental situation is a bit better. An ATLAS search published last December excludes sbottoms below ~400 GeV for a very light LSP, although this search completely loses steam when LSP is heavier than ~100 GeV . Hopefully, we will learn much more at the Moriond conference 2 weeks from now. 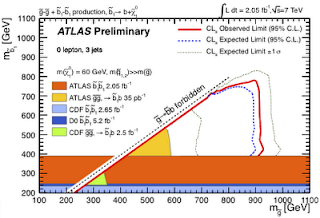 See the new ATLAS notes here and here for more details on the searches for gluino mediated stop production. See also Peter's blog. Lately there's been a surge of interest in hypothetical scalar partners of the top quark, the stops in short. So it may be a good moment to sell a few technical details to a larger audience. For theorists, a stop is easy to distinguish experimentally: it looks like a top but with a twiddle on top. However experimentalists are not as smart, and they have to invest much more time and effort in order to identify stops at the LHC. Stop → top + LSP, Stop → W + sbottom → W + b + LSP, Stop → bottom + chargino → bottom + W + LSP, etc. significant missing energy due to the LSP. which leaves us with 4 top quarks in the final state. The 4-top production rate in the Standard Model is very small, therefore observation of such a final state at this point would be a clear sign of new physics. Another place where this sort of cascades could show up are the searches for same-sign top quarks. cannot be lighter than 500 GeV. During the next 30 days leading to the Moriond conference many more searches based on larger data samples will be released, starting with the Valentine Day ATLAS talk. For today, we can get some idea of the current LHC sensitivity from this paper, which compiles a large number of SUSY searches and recasts the results in terms of limits on stops. 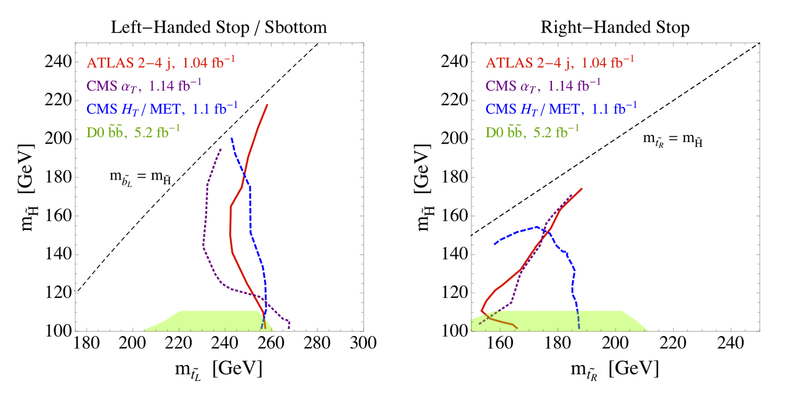 The LHC reach for direct stop production (right plots) is poor, corresponding to stop mass of only 200-300 GeV. 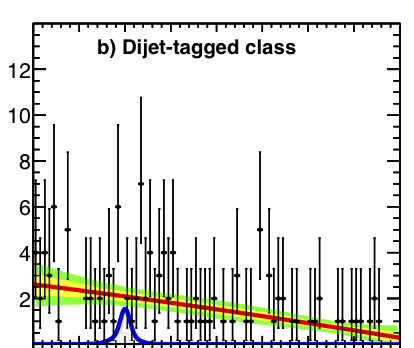 For gluino mediated stop production (plots below) the limits are much better and extend to approximately 700 GeV gluino masses (though the precise limits may depend on details of the SUSY spectrum; it is probably possible to design spectra for which these limits are somewhat weaker). Amusingly, the dedicated ATLAS search does not seem to be the most sensitive probe of gluino mediated stop production. 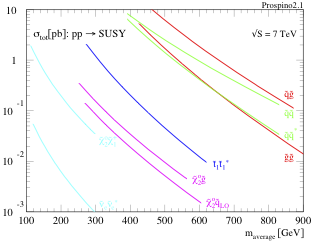 Instead, more stringent limits come from vanilla SUSY searches (decaying top quarks produce jets, b-jets, and/or leptons that can be picked up by these searches). We'll see very soon whether the coming experimental analyses will significantly improve these limits. 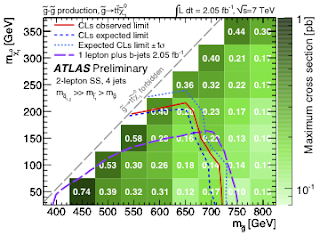 Update: see the slides of the Feb 14 ATLAS talk for more limits on stops. The CMS collaboration had every reason to think that life was unfair. 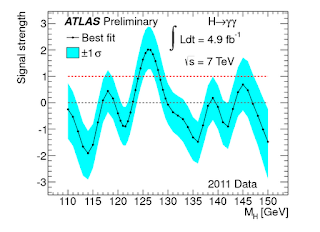 For the last round of Higgs searches they made significantly more effort and analyzed more possible signatures than ATLAS. 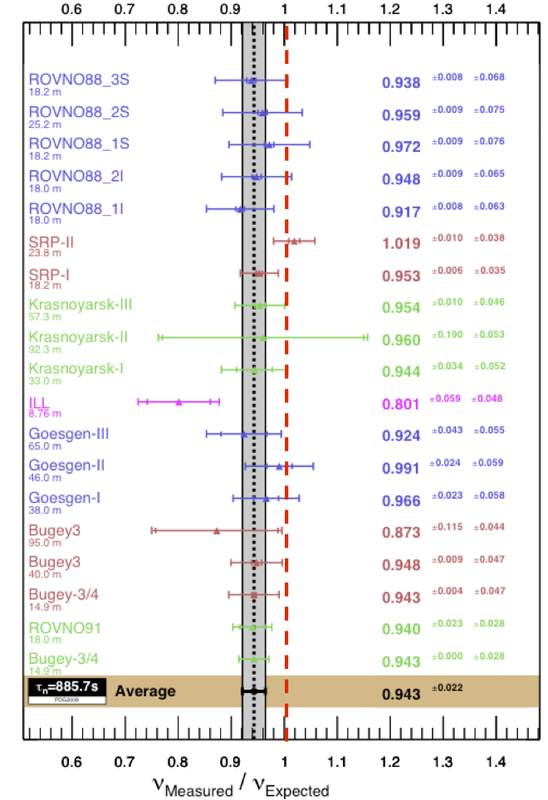 The latter updated only 2 channels to the full dataset, and in principle had worse sensitivity in the H→ZZ*→4l channel (due to slightly higher pT thresholds in the analysis). In spite of that, the significance of the Higgs-like excess near 125 GeV was much weaker in CMS than in ATLAS. 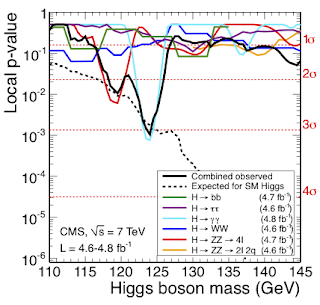 Naturally, the CMS researchers have spent the last 2 months scouring their drawers for strayed Higgs events. And they found. New interesting events are reported in the H → γγ channel. Compared to the December 13 presentation, CMS added a new category of events which, apart from 2 photons, contain 2 energetic jets in the forward (closer to the beam pipe) region of the detector. 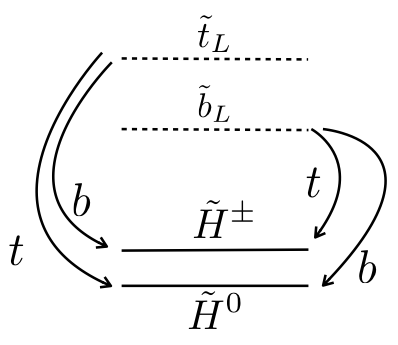 Such events could arise in the so-called vector boson fusion (VBF) process, where each of the 2 colliding quarks emits a W or Z boson which coalesce to create a Higgs boson (right graph). 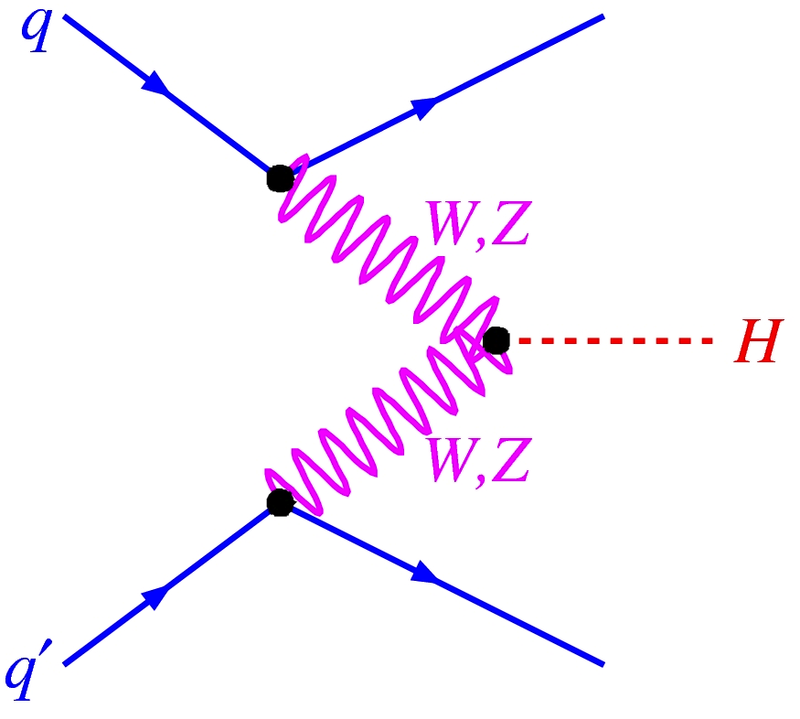 The 2 original quark get deflected and may be seen in a detector as two forward jets. On the other hand in gluon fusion (left graph), which is the dominant Higgs production process at the LHC, the 2 colliding gluons "vanish" and the final state rarely contains 2 forward jets. 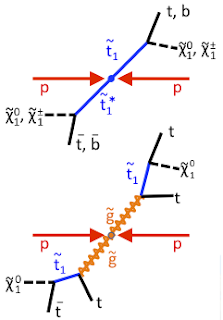 Also background processes are less likely to produce 2 photons in association with 2 such jets. 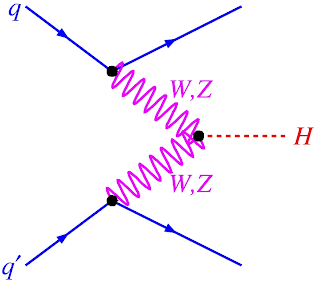 Hence, by selecting diphoton events with 2 forward jets we can probe a distinct Higgs production process, with less signal (the VBF cross section is 10 times smaller than the gluon fusion one), but also with less background. 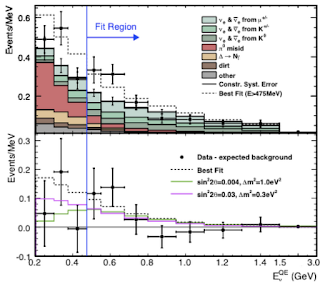 Now, in the VBF class CMS finds 7 diphoton events in a 1-GeV bin at the invariant mass 124 GeV, where only about 2 events would be expected from non-Higgs background. By itself it would be nothing, but together with the rest of events in the diphoton and 4-lepton channels it provides another support for the existence of the Higgs boson in the mass range 124-126 GeV. All in all, the local significance of the excess near 125 GeV in the combined CMS analysis is now over 3 sigma, very similar to that of ATLAS. While many small improvements have been made, my feeling is that significance was pumped up mostly by these additional VBF events. But there is something intriguing here. 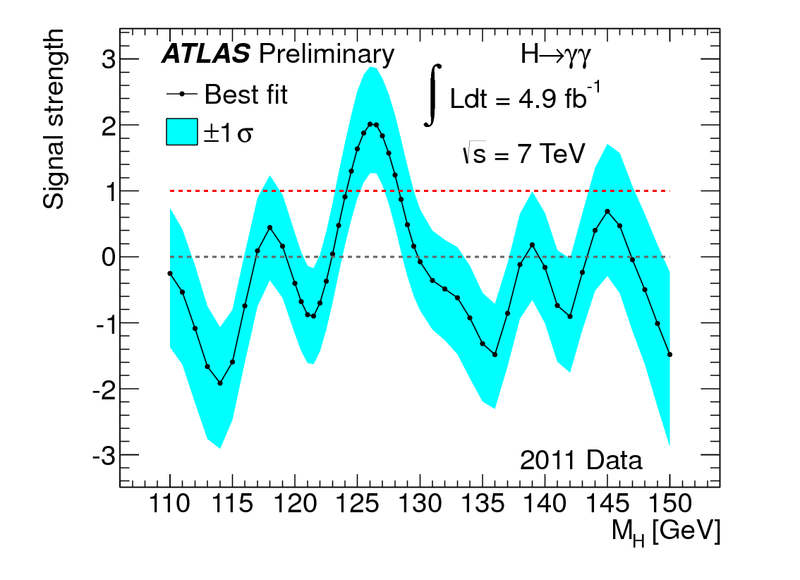 Now in both ATLAS and CMS the best fit of the Higgs rate in the H → γγ channel alone is about twice the Standard Model rate, with the standard rate being over 1 sigma away in both cases. Actually, with the present amount of data CMS would not expect to see any VBF events, as rate predicted by the Standard Model is too small (see below that in this channel their fit is almost 4 times the standard rate, although with a large error). Could it be that we're seeing a non-Standard-Model Higgs boson with an enhanced decay rate and/or enhanced VBF production cross section? Of course, it is far too early for jumping into conclusions: the errors are still large and we may easily be observing an upward fluctuation. 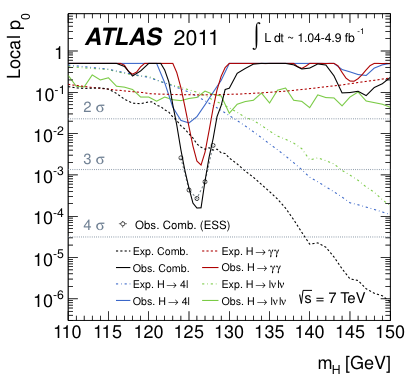 Besides,the combination of all channels doesn't show any dramatic enhancement of the Higgs rate. In any case we're free to speculate while waiting for more data (and a word from ATLAS on the VBF events). See also Matt for more details and more caution.